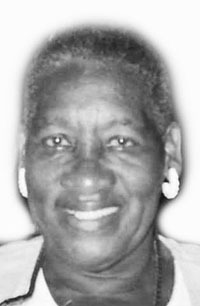 Augustus Funeral Home regrets to announce the passing of Ms. Rosa Fay Jacqueline Baker. A Home Going service for Ms. Rosa Fay Jacqueline Baker, daughter of the late Edmund and Jane Baker, loving mother to Donald and Raymond Baker, Brenda Bean, Ramona and Anthea Baker, Rose-Ann Baker-Burchall and the late Curley Baker, sister to Lorraine Glasgow, the late Edmund Baker, Annie Morgan, Olive Glasgow in her 85th year of ‘East Unit’ 9 North Shore Road, Devonshire will be held at Christ Church, Devonshire on Thursday, January 24, 2019 at 2:00 pm. Relatives and friends may pay their last respects at Augustus Funeral Home on Wednesday, January 23, 2019 from 7:30 pm – 9:00 pm also at Christ Church, Devonshire on Thursday, January 24, 2019 from 1:00 pm – 1:55 pm. Lovingly remembered by 12 grandchildren; 9 great-grandchildren; 1 great-great-grandchildren; son-in-law: late Julian Burchall; sister-in-law: Francis Baker; nieces and nephews: to numerous to mention; godchild: June Trott; special friends Betty Trott, Polly Durham, Russie Woolridge, Pearl Smith.